I’m hardly an unbiased observer, but one can’t help but be impressed with the extraordinary sense of momentum, the sheer energy that’s now being generated by the program. One feels this not only among the community health workers who are simply not allowing any pregnant woman or young child to fall through the cracks, not only among the data analysis team members systematically tracking progress and effectiveness of each of the program components, but also among the beneficiaries themselves: the young mothers exhibiting such pride when they observe their children’s weight gain, the new parents beaming when they that all their efforts have paid off and their newborn is born healthy and with adequate birthweight. That’s pretty qualitative. There has been a quantum leap in the systematic gathering of monitoring data during the past year – and there will be lots to share in the months ahead. Here’s an example which I find pretty dramatic: The data analysis team has been comparing the effects of the Calcutta Kids program with those reported in the National Family Health Survey for urban slums more generally in this state. While one third of the infants in the slums of West Bengal are born low birthweight (less than 2.5 kg or 5.5 pounds), the Calcutta Kids program has been able to cut this figure nearly in half – to 17%. The program also has been able to reduce severe malnutrition in young children by 25% below the state average, a significant improvement in an area still ridden by such environmental hardship. You should have seen the proud smiles on the faces of the community health workers when those findings were announced! Another example of this “culture of curiosity” has been an analysis of families with kids who are severely malnourished. What are the characteristics of these households? What do these families have in common, and how are they unique? This information will be invaluable as Calcutta Kids seeks to eliminate severe malnutrition (which places the child at such risk and has irreversible consequences) from these slums. There is even a plan to examine the pathogens present in these children – work being initiated with the National Institute of Cholera and Enteric Diseases. And another observation: It’s been clear to the Calcutta Kids for some time that the problems of malnutrition and of low birthweight in India –much worse than in Africa despite India’s rapid economic growth – are symptoms of the lower status of women. Calcutta Kids has been relentless in addressing this problem, working both to empower women in these slums, and to celebrate the female child while actively involvinghusbands and mothers-in-law in the process. And one can begin to feel the change. Women work together more closely. They speak out more confidently. And it seems to me that they’re holding their heads a little higher. You’ll be pleased to know that as of this month, 850 families in the slum are covered by Calcutta Kids’ low cost health insurance (costing less than $2 per person per year). Calcutta Kids is looking for new and creative ways to increase both enrollment and renewals so that the tragic pattern – so frequent in these slums – of families forced into severe debt when serious illness strikes, can become a thing of the past. The insurance program received lots of timely advice from Susan Richardson, former vice president of United States Liability Insurance Group, a Berkshire Hathaway company who spent 6 weeks with the insurance team. And this work is not going unnoticed. During my time in Kolkata we had visits both from development agencies and from public health experts like Jon Rohde, former director of UNICEF in India and Dilip Mahalanobis, credited with the discovery of Oral Rehydration Solution. All have been curious, as I have been, to fully understand what’s behind the remarkable success being achieved here. At the beginning of February, the primary public health institution in the state awarded Noah their Founders’ Day Award in recognition of these accomplishments. Noah, in typically humble fashion, passed on the honors to the rest of his team. Rekha Shaw is an out-going, energetic woman who participated actively in the YChiNG trial. Her two youngest children were malnourished and were in a terrible condition when we enrolled them in the program. Rani, at 29 months, weighed 7.31 kg (a little over 16 pounds) with a weight for age z-score (WAZ) of -4.296. Rani was stunted and developmentally delayed—she could not stand up, let alone walk. Her younger sister Madhu was faring slightly better but was still severely underweight: at 16 months, she weighed 6.58 kg (about 14.5 pounds) with a WAZ of -3.3. Both girls were very anemic, had high worm loads, and suffered from frequent acute infections. Their mother, Rekha, has six daughters, a result of repeated pregnancies in an attempt to have a son. Tragically, she did have a son (born after the first four daughters), but he died just after birth for reasons she does not know. She lives with a mother-in-law who is not supportive and pressures her to bear a son. She also lives with a husband, who drinks and does not care for her or the children. She says, ‘There is nothing good about that man. He does nothing. He beats me.’ As her husband’s income was not sufficient, she began working outside of the home as caretaker (for an ill person) in order to provide for her children. Recently Calcutta Kids held a graduation program for children who participated in a 6 month trial to address severe malnutrition in Fakir Bagan. The thirty-three children enrolled in YChiNG (Young Child Nutrition Group) were invited to a weekly feeding and GMP session at the DTC. 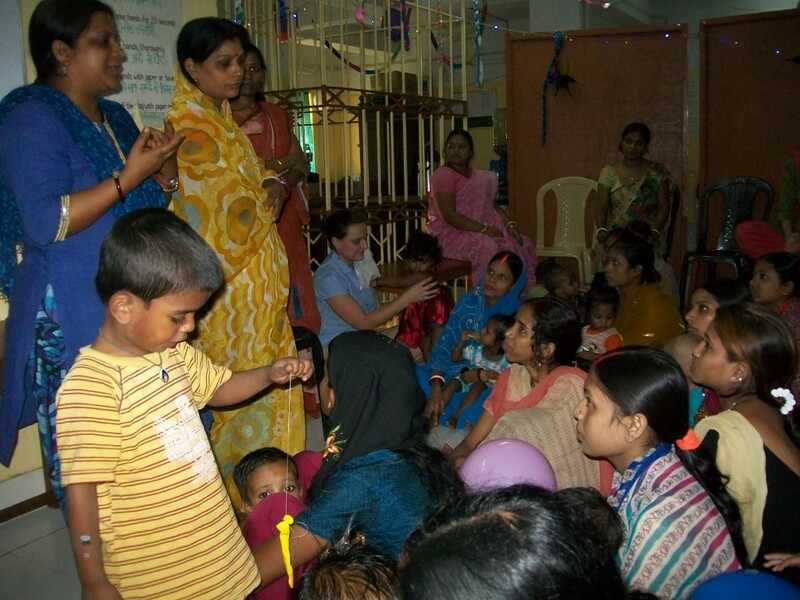 They had access to the Calcutta Kids pediatrician, free medications and micronutrient supplements, and free routine and follow-up pathological tests. Read more about the YChiNG trial here. The graduation program marked the close of the YChiNG trial and was an opportunity to celebrate with the mothers and children who had participated in the program. Some children made remarkable strides in weight gain and growth, while those who did not fare as well (mainly due to lack of attendance) were given encouragement and asked to return for weekly meeting sessions. The graduation program was a fun event that mothers and children enjoyed thoroughly. The MYCHI Program Coordinator, Sumana, talked about the YChiNG program and its impact. She thanked the mothers for participating and working hard to better the nutritional status of their children. Three mothers shared their stories and experiences with YChiNG. Rekha Shaw, whose youngest daughters Rani and Madhu participated, spoke about the improvements she had seen in her girls because of the program. Shanti Shaw, whose son Sujay had been hospitalized a year earlier due to severe malnutrition, described his recovery and how they were assisted by Calcutta Kids. Sabitri Prajapati spoke about her son Ayush who was born with low birth weight and was not growing well until he participated in the YChiNG program. 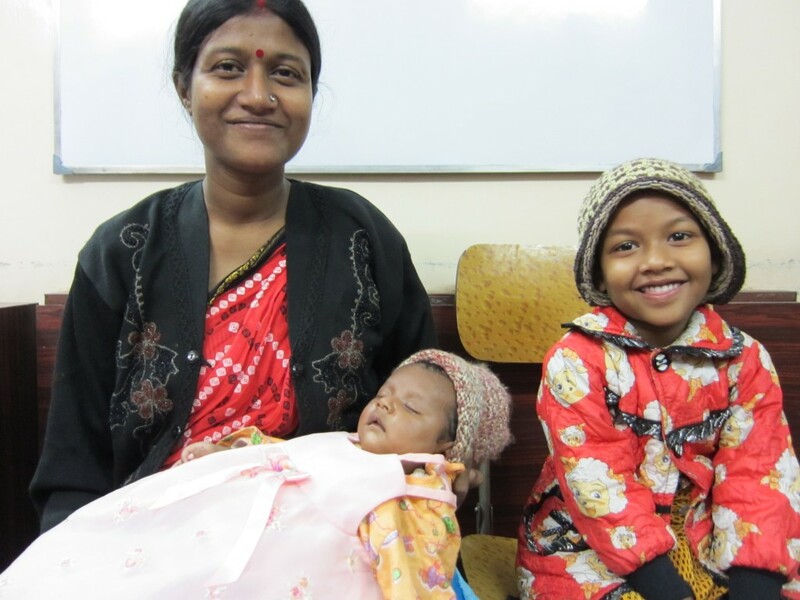 On October 28th, Sima Das, a community health worker here at Calcutta Kids gave birth to a beautiful baby girl, Sonali. Sonali could very well have been the 7 billionth baby born into this world, with the UN symbolically marking the milestone only three days later on October 31st. While population growth and the escalating urbanization of India are large issues, the biggest issue in Sima’s family and the people of Fakir Bagan who had seen Sima throughout her pregnancy was the gender of her baby. As we were walking through Fakir Bagan two weeks ago, Sima’s first time back since Sonali’s arrival, (just to visit!) women in their doorways called out “Kya huan?” meaning, “What kind?” (boy or girl) and Sima would respond “Larkie” meaning “Girl”. As we progressed through the slum, the response became steadily softer and more timid. Sima is a strong woman. She is confident in herself as a mother, as a facilitator for health and as a role model for the community. But with disapproval and doubt coming from all sides, Sima started to doubt her belief that her second female child was not a limitation or liability. Back at the office, with the other community health workers gathered around, we talked about how Calcutta Kids is a well run organization with a workforce that is 90% female, how the Chief Minister of West Bengal is a woman, and how the Government of India is run by a woman (although not officially). However, even with these great examples of powerful and influential women, Sima was still frustrated and upset. West Bengal is not known for female feticide, unlike states like Punjab and Harayana where there are only 750 girls for every 1,000 boys. Even if the girls are not missing, the female children are clearly not valued in the same way as their male counterparts. This preference for male children indirectly leads to many of the problems that Calcutta Kids works to solve. Like the high rate of low birth weight which is mostly caused by women not eating enough during pregnancy. Or the high rate of domestic violence that is tolerated because women do not have the power to stand up to their husbands.